The Seafire is an aircraft that one doesn't see a lot of aftermarket for and it is great that there are now a couple of new sheets for it. 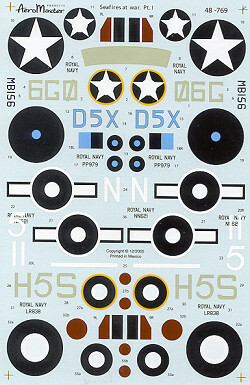 This sheet is designed for the Airfix Seafire Mk III or the Tamiya/Hasegawa Spitfire V (which is, I guess, the basis for the Seafire II). These are mostly in the standard FAA scheme of Dark Slate Grey/Extra Dark Sea Grey (EDSG) over Sky. I should point out the the EDSG faded quite rapidly so many modelers use Dark Sea Grey in its place. First up is a Mk.II from 885 Sq during Operation Torch. It has the standard scheme with sky band and nose. The insignia have a white star painted over them to keep the Americans from mistaking the markings as French! 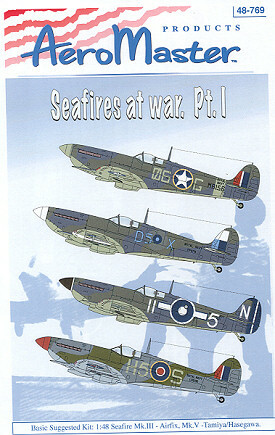 Next is the first of three Seafire IIIs. This is from 807 Sq operating in the British East Indies. It has the SEAC roudels and white bands on wings and empennage. From 880 Sq during mid 1945 is this black nosed version. It has a black rudder with a white band on it and the later SEAC markings. Finally, in the standard RAF colors of Dark Green/Ocean Grey over Medium Sea Grey is this 761 Squadron plane. It was operating in Scotland during mid 1945 and sports a red spinner. The sheet carries roundels for all so stock up on those kits!